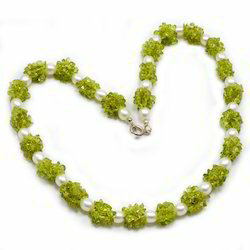 In order to meet the different requirements of the customers, we are involved in offering Pearl Bead Necklace. This Pearl Bead Necklace is known for its elegant design and patterns. 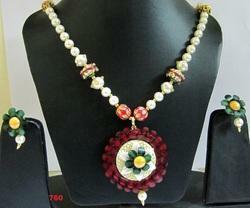 Customers can avail this Pearl Bead Necklace in different sizes and as per the latest fashions. We are the manufacturer and exporter of Quality pendant necklace. Our range of Pearl Beaded Pendant Necklace is very famous among our clients. This pendant necklace got lot of admiration from both national and international level. Exclusive 3 Strand Fresh Water Pearl Beads Necklace with Sapphire Drop. Keeping in mind the style trends, we specialize in manufacturing and supplying pearl beaded necklace set with coordinating earring. Our production facility enables us to manufacture customized necklace sets that meets the client requirements and caters to his market.